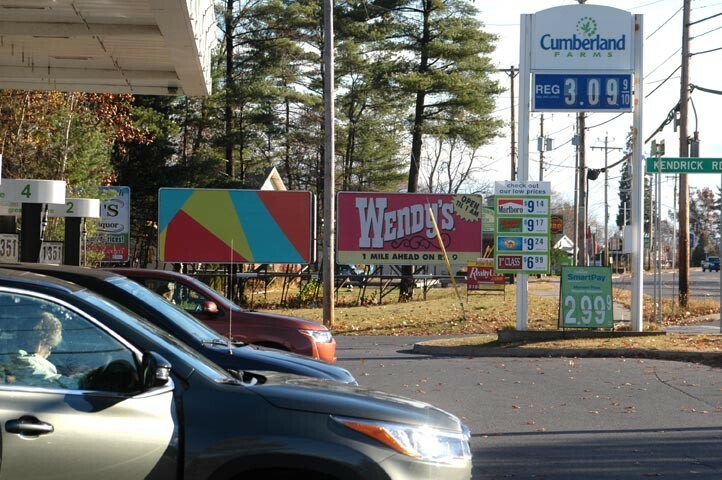 Rob Hitzig's art billboard in Queensbury, N.Y. Rob Hitzig is known for his meticulously polished, wall-hung wood sculptures, but some 200 customers have collected his abstract-art bumper stickers. The Montpelier artist has been making the brightly colored little rectangles since April 2013 and mostly giving them away. This month, Hitzig has taken the concept to a way larger venue: a billboard. Of course, he's also taken it out of state, since billboards are illegal in Vermont. The one pictured here — obviously, the one in the middle — is alongside Route 9 in Queensbury, just south of Lake George. It's near Interstate 87 between exits 19 and 20, Hitzig specifies in an e-newsletter. He rented the billboard space for four weeks; it went up November 11 and will be on view until December 8. If you're traveling the New York State byway anytime soon, be sure to wave. Or just contemplate. "My concept is to provide a gift of mental space for viewers as an antidote to the barrage of messages constantly demanding something of us," Hitzig writes. "Ironically, I have to leave Vermont and use a billboard in an attempt to create the same feeling that one gets driving around our billboardless state." How much did it cost for Hitzig to erect his wordless message? "$1,200 for four weeks plus $185 for printing and installation," he reveals. And, yes, the piece is for sale. "I hope to raise money from the sale of my billboard so that I can do more," says Hitzig. Did someone mention "barrage of messages"? So does he wish he could put up art billboards in Vermont? "I'm thrilled Vermont doesn't have billboards, and this project makes me appreciate it even more," Hitzig says. 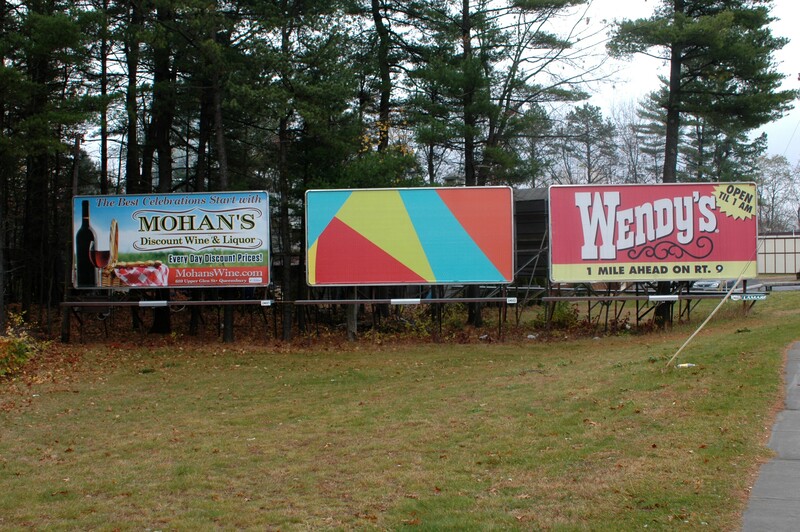 "I feel that I am sort of proselytizing a Vermont aesthetic of being billboard-free by installing art billboards in other states. "At its core, though," he continues, "I hope people see that the work is about giving people mental space and letting them just 'be,' rather than telling them what to do/think/believe." If you don't have any place to hang billboard-size art, you can consider getting a bumper sticker and make your own wordless statement. You have to live in the U.S. to get one free — and just one per customer; after that, they're $10 each. "I can't afford to give unlimited bumper stickers to all 300 million American residents indefinitely," Hitzig notes sensibly. You can read more about his project on his blog, Wood Is Art. This Billboard Could Be Yours!